As U.S. influence over global oil skyrockets, IHS Markit’s CERAWeek 2019 saw historic increases in U.S. government attendees and record lows in Saudi, Russia, and OPEC representation - both confirmations that, thanks to the innovative shale industry, we’ve officially earned the title of world’s largest oil producer. Foreign oil imports are quickly becoming a thing of the past for the U.S., after enjoying record growth in domestic production with oil output exceeding 12 million barrels per day. And tech companies are scrambling to get in on the action. A sign of the changing times, OPEC, Saudi, and Russian officials were scarce at CERAWeek, showing the lowest attendance in at least five years. In stark contrast to years past, OPEC Secretary General Mohammed Barkindo stressed OPEC’s desire to collaborate with U.S. shale. Washington D.C. had some historic representation as well. The U.S. Department of Energy contingent attending CERAWeek was the largest on record, and Mike Pompeo delivered the first-ever keynote address by an active U.S. Secretary of State. Pompeo emphasized our need to protect oil supplies and hold bad faith actors accountable. 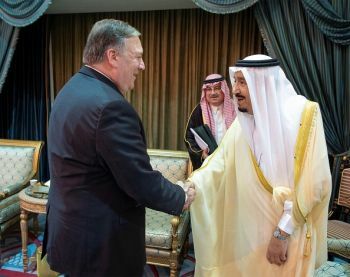 In a private meeting with BP PLC, Royal Dutch Shell, Chevron Corp. and BP plc, Pompeo and energy advisor Frank Fannon reportedly discussed strategies to boost foreign purchase of U.S. oil. Another sign of the shift, more and more tech companies are vying for a spot in oil and gas. As covered in my new book, Giant Shifts: Energy Trends Reshaping America’s Future, energy execs know that digitalization, AI, and automation throughout every stage - exploration through exportation - can increase safety, cut costs, and amplify output. This presents a massive opportunity for established tech companies, startups, and digital investors alike. Exxon has teamed up with Microsoft, while Shell and Haliburton are excited about what Amazon can offer – including a data-storage assembly that Amazon submerged in water during CERAWeek to show off its durability. Among this year’s over 4,000 attendees were leaders in energy digitalization, including Microsoft Corporation, Amazon Web Services, inRobotics Inc., MicroSilicon Inc., Aveva Group plc, Tachyus Corp., Siemens, and PrecisionHawk. CERAWeek’s tech-focused sessions, grouped under “Innovation Agora,” covered everything from subsurface Cloud intelligence, robot inspections, AI-based software and digital twins, to integrated asset analytics, virtual reality, smart drones, and on-demand aerial intelligence. Emerson execs showed up to demonstrate the company’s latest and developing energy applications, including its industrial Internet of Things technologies and novel organizational capabilities. “Technology is transforming the global energy landscape, driving implications for how the industry operates, staffs and performs today and for years to come,” said Emerson chairman and CEO, David Farr. You can learn more about how tech is transforming the oil and gas industry in Giant Shifts: Energy Trends Reshaping America’s Future.